In addition to gardening, Jane G. Pepper has a few other passions: bicycling, traveling, her pet poodles, and even a little rock ‘n’ roll–she loves the Beatles! In celebration of her tenure has head of The Pennsylvania Horticultural Society for three decades, some of her friends created “Pepper’s Lonely Hearts Club,” a garden display evoking her many interests, from her beloved Scottish heritage to bits of Fab Four nostalgia (look for the Yellow Submarine mailbox). In all, it’s a truly stunning exhibit. 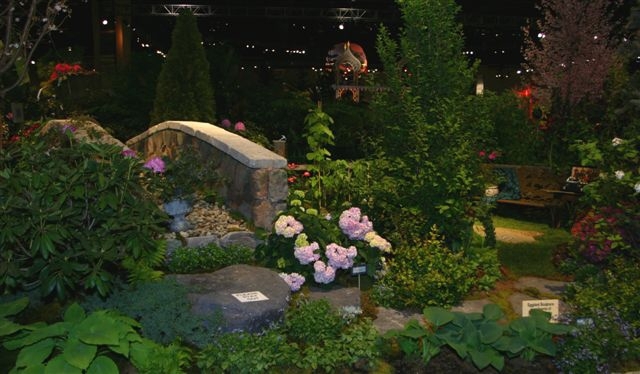 This entry was posted on March 7, 2010 at 3:32 am and is filed under 2010 Flower Show - Passport to the World, Attractions, Garden Displays, Uncategorized. You can follow any responses to this entry through the RSS 2.0 feed. You can leave a response, or trackback from your own site.